Kayla Jackson is an aspiring physician-scientist from Los Angeles, California. 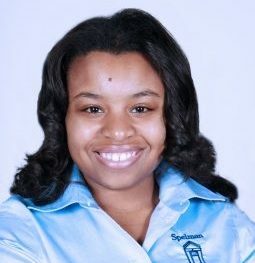 She is currently a senior at Spelman College where she is working towards a Bachelor of Science degree in Mathematics. Kayla is a member of the Ethel Waddell Githii Honors Program, National Society of Collegiate Scholars, Alpha Lambda Delta, Pi Mu Epsilon, and Phi Beta Kappa. At Spelman, she has maintained an interest in the revealing social and genetic determinants of health. Her commitment to medical research has fueled her current participation in the Research Initiative for Scientific Engagement and previous participation in the Louis Strokes Alliance for Minority Participation in Research, where she conducted biomedical research on novel biomarkers for cardiac recovery after a heart attack at Morehouse School of Medicine. In summer 2015, she worked with a renowned geneticist, Dr. Karen Mohlke, at the University of North Carolina, Chapel Hill on a study that seeks to identify a genetic basis for diseases like diabetes and high blood pressure. Kayla has presented her research at national conferences such as the Annual Biomedical Conference for Minority Students, National Conference on Health Disparities, Experimental Biology, and has attended quantitative biology workshops at Massachusetts Institute of Technology. Additionally, she has had the tremendous opportunity to study abroad in Lima, Peru and participate in a domestic exchange at Loyola Marymount University. She has placed importance on advocating STEM to the next generation of young scholars and has been involved in various community outreach programs through Helping Our Warrior Women (HOWW) and as a STEM outreach ambassador. Post-graduation, Kayla hopes to attend a combined M.D./Ph.D. program at the University of California, San Francisco.